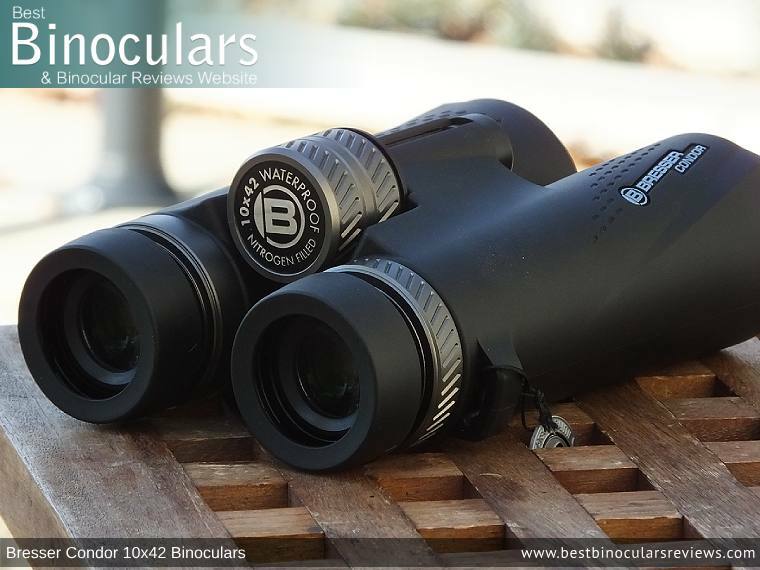 The German brand Bresser has been making the Condor for a long time now, indeed, the first time I reviewed a Bresser Condor binocular was well over a decade ago now and I have to say back then, the instrument I tested bears almost no resemblance to their current version. In fact, if you take a look at their main features and specifications and comparing them, it instantly becomes obvious that the massive amount of changes are well more than just skin deep. Available in a wide variety of configurations ranging from the 8x or 10x25mm compacts, right up to the large 10x or 8x56mm versions the new mid-range Bresser Condor is a versatile series that looks to me to have come a long way over the past decade and is squarely aimed at providing the serious, but price-conscious nature lover, traveller, birder, hunter or sports fan an instrument that they can depend upon, but without breaking the bank. Fully Multi-Coated Optics with Silver "Ultimate Reflection Coatings"
Almost immediately after taking these Bresser binoculars out of their box I thought to myself that they have a very appealing, modern look to them and there is no doubt that because of this as well as features like the metallic focus wheel and diopter adjustment ring that they look like a far more expensive instrument than they actually are. The general shape is fairly typical for a modern roof prism binocular with a single, fairly narrow bridge (4cm) that is positioned closer to the ocular lenses than the objectives. The hinge itself feels very robust, yet at the same time it opens and closes smoothly, but with the right level of friction to ensure that it remains at your chosen setting. Speaking of which, this new Bresser Condor 10x42 binocular permits you to take the IPD (Inter-Pupillary Distance) from a minimum of 5.6cm, up to 7.6cm with the hinge full open. This IPD range is pretty conventional for a 42mm roof prism binocular. Apart from a ring that matches the diopter ring near the left eyepiece, the entire exterior surface of the chassis is covered in a black rubber coating. Bresser Sport Optics has gone with a hard rubber, combined with the smooth, almost velvet-like outer finish looks great and is certainly what adds to their modern and expensive appearance, but this does result in a surface that offers substantially less grip than an instrument using a thick, soft rubber coating. Another downside is that it provides less cushioning and thus less impact protection than thicker, softer armors. Importantly and on the positive side, the armor fits onto the chassis underneath very tightly and so there is no chance of it slipping or moving about. Also, in my experience, harder rubbers are also less likely to perish and go sticky as is the case on some instruments using a softer, less robust type of rubber. Whilst they have a metal bridge, the rest of the chassis on these and indeed all the other new Bresser Condor binoculars is made from a polycarbonate known as PPS (Polyphenylene Sulfide). This is quite commonly used on binoculars as PPS plastic has a high resistance to wear, excellent strength characteristics, a high resistance to heat, chemical resistance as well as great dimensional stability. On top of all this PPS has a great cost to performance ratio and so whilst it may not be as luxurious or quite as strong as the magnesium housings used on more expensive products, for most users is it more than sufficient and helps keep the price of the instrument down to a more affordable level. 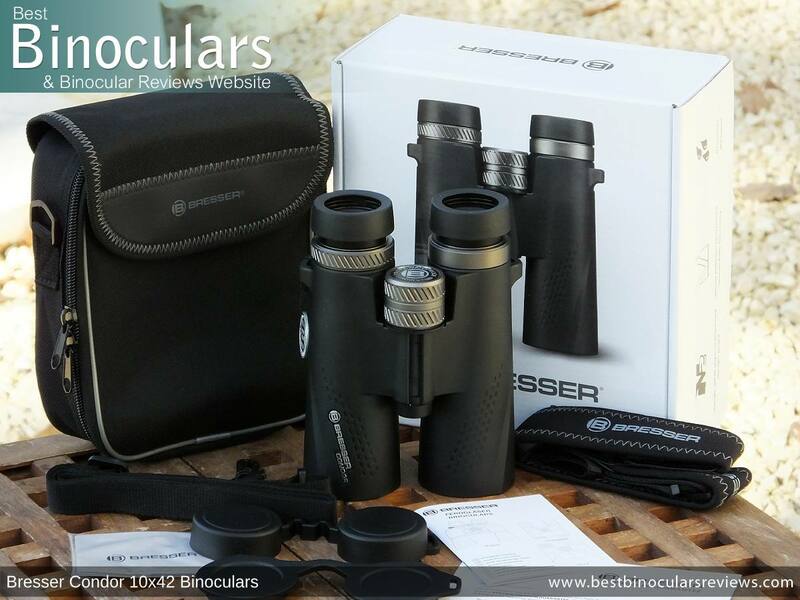 These Bresser 10x42 Condor binoculars are advertised as being waterproof, but there is no mention of any specific rating or recognized standard. The airtight interior is also filled with a completely moistureless Nitrogen gas which prevents the internal optical surfaces from fogging up under certain circumstances. 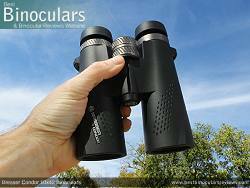 I was very impressed when I discovered that the new Bresser Condor binoculars use aluminium and not plastic housings for their eyepieces. At this price range, this goes well beyond what I would normally expect and considering that this is the part of a binocular that most often becomes damaged when dropped, it is an important feature. Like the rubber coating on the body, the eyecups are covered in a thin and very hard rubber. Whilst not quite as comfortable as some that have more padding, it is fixed on very well and I doubt it will come away very easily. With no free play or looseness, the mechanism and action on the twist-up cups on my sample was very smooth and they satisfyingly clicked positively into each of the designated click stops. Indeed I would go as far as to say their action is truly superb and definitely a lot better than most you will find at this price level and most certainly at least partly a result of them having metal and not plastic eyepieces. It is usual to get 3 click stops (1 intermediate) but on these Bresser Condor 10x42 binoculars, you get 4 click stops (2 intermediate) and thus they offer an even better level of customization and thus more chance of making them perfectly suit your exact needs (with or without glasses). At 15mm I would not describe the level of eye-relief as very long, but for most users, even those who wear glasses, it will be more than sufficient. I did test them for this and whilst wearing my sunglasses and by fully twisting down the eyecups, I was able to achieve almost the entire field of view with only a minimum, but acceptable amount of dark edging around the outer limits of the view. 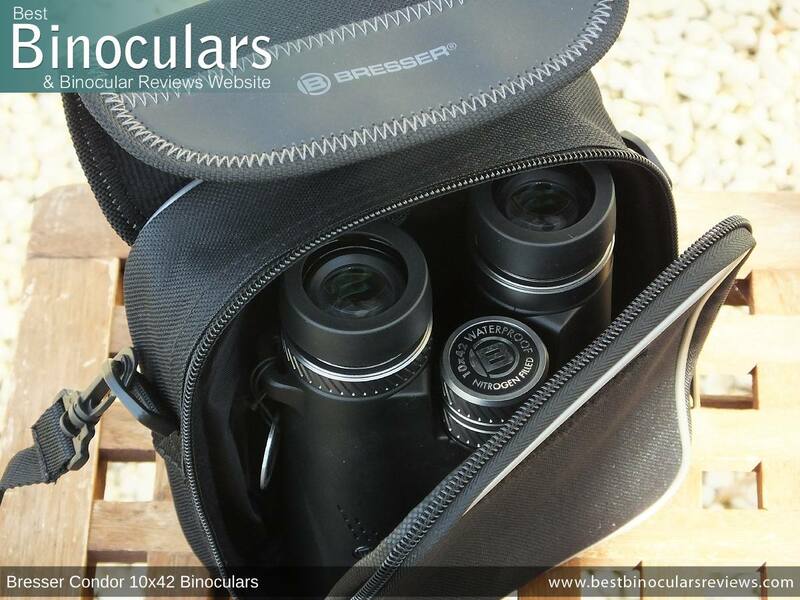 As with the eyepieces, the focus wheel on these Bresser Condor 10x42 binoculars is excellent and another real highlight on this instrument. To start with, at this price level to have a metal focus wheel is rare. In this case it is aluminium which really looks and feels great to use. Then there is the action, which is lovely and smooth with absolutely no free play or stiff points anywhere along the entire focal range. I like the fact that the wheel is large (30mm diameter & 25mm long), but almost more importantly is the fact that it is perfectly positioned and sit's proudly above the barrels (see image above). This makes it really easy to reach and along with the smooth action, easy to accurately adjust even whilst wearing my thick winter gloves. The gearing of the focus mechanism is such that it takes roughly 1¾ turns (630°) of the wheel to adjust the focus from one extreme to the other. This is a fraction on the longer side and thus leans towards making fine adjustments that bit easier, but on the flip side, big adjustments require a little more turning and thus time than a binocular that has more aggressive gearing on the focusing mechanism. The only slightly negative point that I have about the wheel and the focusing mechanism is the level of grip. It would have been better if they had added a thin rubberized track or made sharper, more pronounced grooves or dimples around the wheel. However, the fact that the wheel is so smooth and well positioned does more than make up for this. I am always amazed as to how many people I hear about who have been using their binoculars for years and did not know how, or even know that they could calibrate the instrument to match their particular eyesight. This is an important step to making sure that you get the best possible view and so if you don't know, please take some time to read the article in the link above. Located in the most common position near the right eyepiece and matching the focus wheel it is also made out of aluminium. Once again this is excellent because at this level most are simply made from plastic. I found the diopter on this Bresser to work as it should. It is inconspicuous and tight enough so that your desired setting does not get moved by accident, but at the same time not so tight so as to make any desired adjustment too difficult. 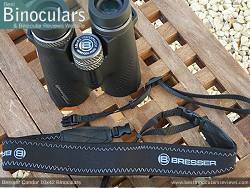 The Bresser 10x42 Condor binocular is 'tripod adaptable'. This means the dust cap at the center of the hinge can be unscrewed and then a standard tripod adapter screwed in making it very easy to fix these binoculars onto a tripod should you wish. 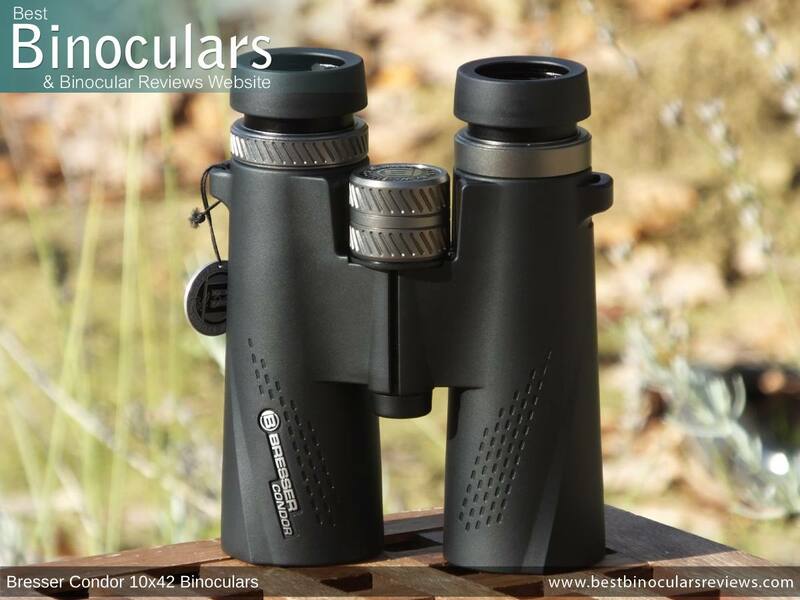 In terms of their weight (669g / 23.6ozs), you can see by the table below, these Bresser Condor 10x42 binoculars rank up there with the most lightweight 42mm binoculars, which is made all the more impressive when you consider they the use a number of metal parts (focus wheel, diopter ring, etc. ), whereas many lower cost instruments will use plastic. As you can also see in the table above, their dimensions are well within the norm for a 42mm binocular and so there is not much to report or comment on here. 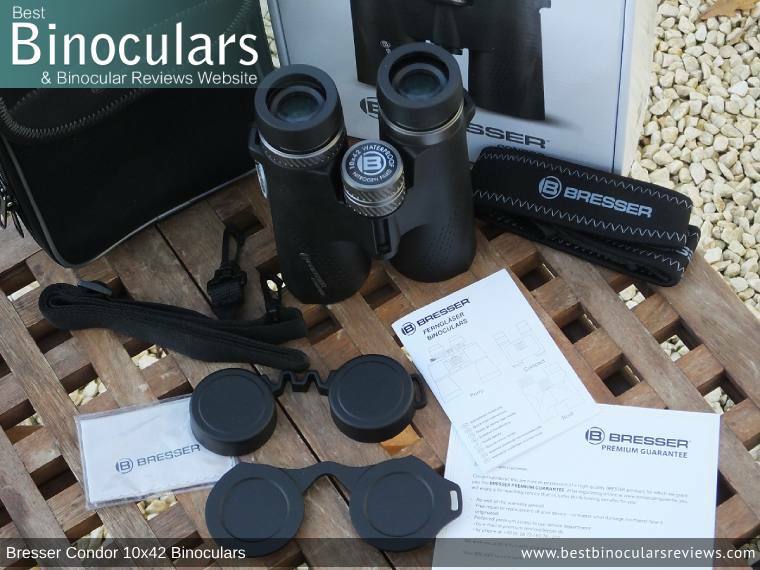 There are 8 individual glass lens elements that make up the eyepieces within these Bresser Condor binoculars four of which are fixed together to form 6 groups. I measured the outer lens, which has a diameter of 20mm in diameter, which for a 42mm binocular is not massive. Potentially larger lenses can offer some advantages which you can read about in this article on binocular ocular lens size, but as long as they are not tiny (which these are not), I would not be concerned. Set-back a good 10mm from the ends of the barrels, the 42mm objective lenses are very well protected from light rain, settling dust as well as physical damage. Bresser does not mention the exact makeup of the elements within their objective lenses, so I cannot comment here. No ED glass - Not a problem! 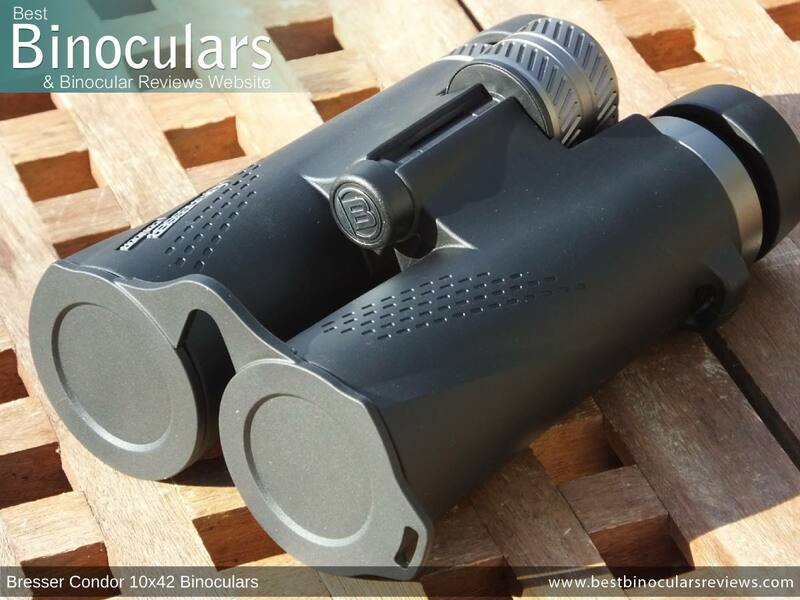 All good quality modern binoculars, including these Bresser Condors, will use optical glass that already has low dispersion properties, but some will go further and use special ED glass elements. In a well designed optical system using very high-quality glass and great expertise, ED elements can help reduce chromatic aberrations even more, which in turn can potentially lead to less color fringing in the viewable image. Whilst in terms of marketing, this really sounds great and it is when they get it right and it is done properly, but in reality I often find high-end non ED glass binoculars that can show as little or even less color fringing as most low or even medium quality instruments that are advertised as having ED glass. So the takeaway here is simply not having ED glass should not at all concerning, more importantly is has the whole optical pathway been designed well, by experts with great precision using high quality optics. As a consumer the only real way to know is in the result of the image that they produce. To see exactly how these performed, take a look at the Image Quality Section Below. Theses and indeed all Bresser Condor binoculars use Schmidt Pechan roof prisms in order to rectify the image that gets inverted as the light passes through the objective lenses. 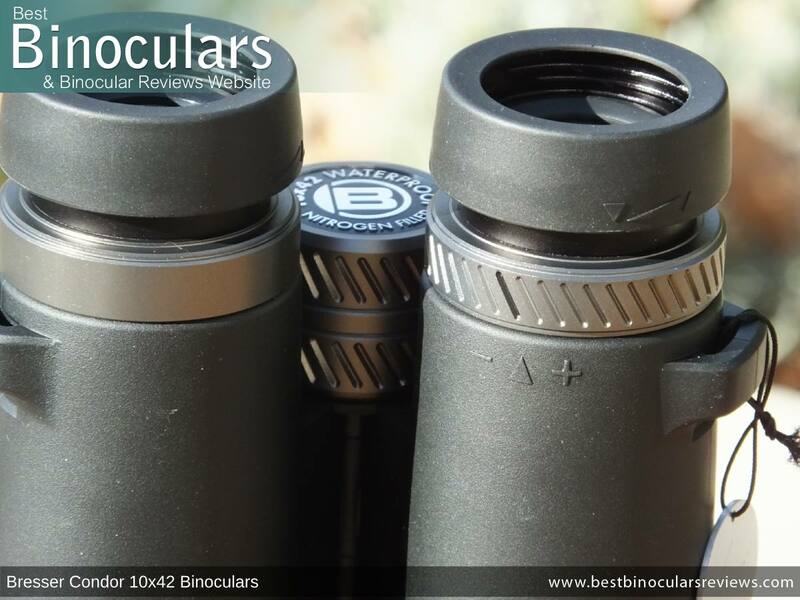 Here Bresser does mention that they have used BaK-4 Glass in their prisms which is good as for use in binoculars it is generally considered to be a better option than the cheaper but also commonly used alternative of BK7 glass. The advantage of these over Porro prisms (the other commonly used design) is that they are more compact and because the light exits in the same line as it enters, you can make a more streamlined and compact body shape. However, the downside to the roof prism design is that it requires a number of coatings in order for it to perform optimally. Lower quality binos will often only be Fully Coated (all outer lens surfaces have a single layer coating) or Multi-Coated (only some outer lens surfaces are multi-coated). These Bresser 10x42 Condor binoculars have an optical pathway that is Fully Multi-Coated, meaning all outer lens surfaces are multi-layer coated which makes a big difference in terms of the quality and brightness of the view. Bresser mentions that these use their proprietary UR (Ultimate Reflection) Coatings, which are the same as they use on their top-end models, but as I say other than that we cannot know exactly what this is or means. On the prism, Bresser has gone with a silver mirror coating, which is good and at this price level pretty much the best you could hope for. However, it has to be said that it does not reflect as much light as the dielectric mirror coatings that they use on their top end and far more expensive Pirsch ED binoculars. Also important to note that the prisms have not been phase corrected which I guess at this price is par for the course, but you always hope for more. To be fair to Bresser though, there are very few instruments that have phase correction coatings in this price range unless they have been heavily discounted. 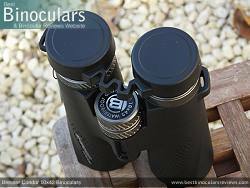 This new version of the Bresser Condor 10x42 binocular has a FOV that is 112m wide at a distance of 1000m away (approx. 333ft @ 1000 yards), is truly excellent for a binocular. This wide field is of great advantage to birders, hunters and general wildlife observers as it makes it easier to quickly locate an object in your view and then follow if it is fast moving. It is also great for exploring and searching for objects over wide areas. I consider a minimum close focus distance of 1.82 meters (6ft) or less as being excellent for a full sized 10x42 binocular. So at 3 meters (9.8ft), the official close focus distance on these is good, but not excellent. However, as is often the case, the official close focus distance supplied is conservative and I was actually able to focus on an object at only 2.35 meters away (7.7ft). The result is still not quite excellent but these Bresser Condor binoculars are certainly fine for occasionally viewing butterflies or flower at very close range, but not ideal if this is your primary intended use. 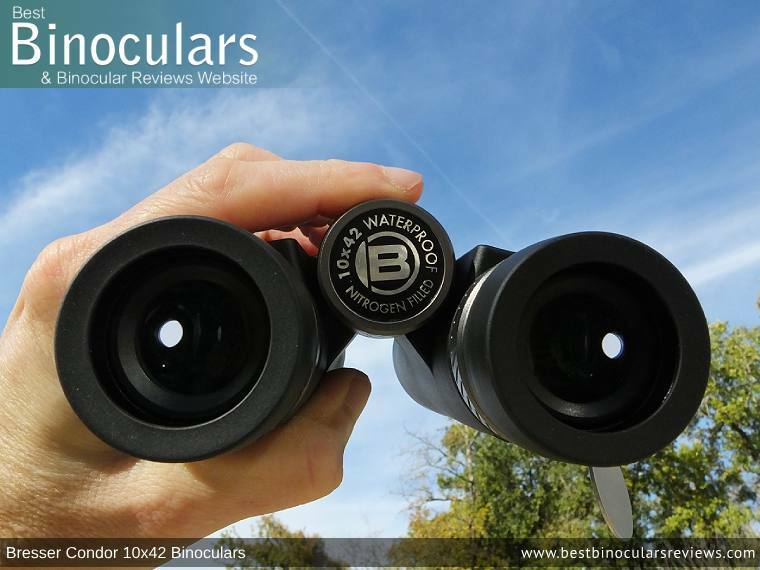 These Bresser binoculars offer 15mm of eye-relief, which like the close focus is good, but not excellent. Having said that, 15mm is more than enough for most users and usually enough for those who wear glasses to be able to twist down the cups and still get the full field of view. I did test them whilst wearing my sunglasses and I was able to achieve almost the entire field of view with only a minimum, but what I would call an acceptable amount of dark edging around the outer limits of the view. Writing about and comparing the image that I observe is, without doubt, the most difficult aspect of my binocular reviews, yet it is imperative that I not only get it right, but my comments need to be consistent over time and as subjective as possible. In terms of the brightness of the view, these Bresser Condor 10x42 Binoculars easily performed as well as my mid-level benchmark and it was only really in poor light conditions that there was an observable difference in image brightness between these and my alpha binoculars. If you take a moment to consider that my alpha is far more expensive and uses the very best optics including dielectrically coated prisms, this small difference is perfectly acceptable and indeed it is quite impressive that it is so minor. Thus, I would describe the image brightness of this Bresser as very good and easily amongst the better performing 10x42 binoculars in their price range. The level of contrast in the image is also good and I really could not observe any difference in this area between all three binoculars in good lighting. In poor light, I must say that the difference between light and dark areas on my alpha was more obvious, which is certainly down to them producing a brighter looking view. The colors you observe through these Bresser Condors look true to life and I never observed any sort of tinting that you sometimes get, especially on binoculars that use cheap optical glass for the prisms. Caused by chromatic aberrations, the level of visible color fringing in the image produced by these 10x42 Bresser Condor binoculars is minimal and certainly no more than what I would expect to see from a mid or even high level 10x binocular. So as I discussed in the optical components section above, the fact that these do not use ED elements in the lenses is really a non-issue as during my tests I thought that they compared very well to my mid-level benchmark instrument and whilst there was some reduction of color fringing looking through my alpha level benchmarks, the difference was minor. 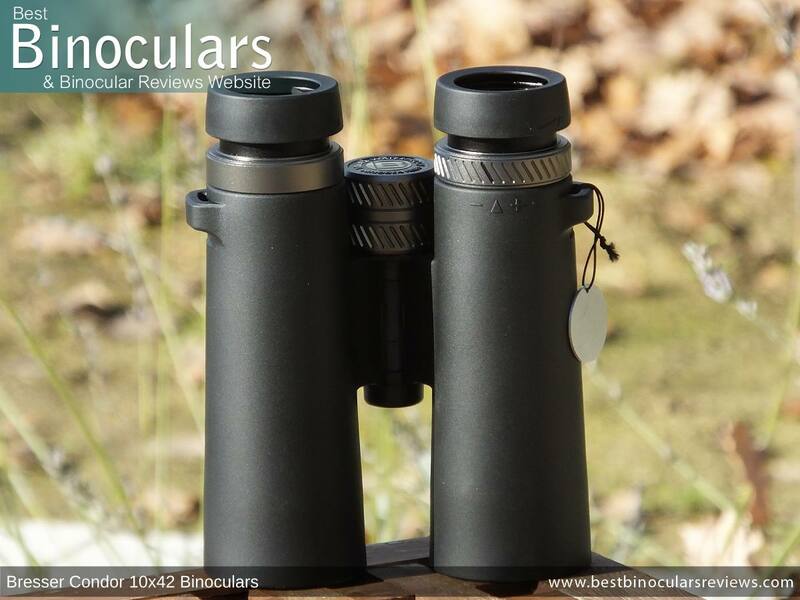 This I would describe the level of color fringing as minor and can confidently say that they perform as well as the better mid-tier binoculars in this area and this includes those that use ED glass. The extremely low level of softening right at the edges of the view is a definite highlight on these Bresser binoculars and I never became aware as any distortions in the view like image curvature. I would describe the overall image definition as good when compared to an alpha level instrument and very good when compared to instruments in their class. In my experience and after comparing them against my benchmark binoculars, I would rate the view through these Bresser binoculars as very good for a mid-level 10x42 binocular and compares well against some higher, more expensive products. These Bresser 10x42 Condor binoculars come supplied with the most common arrangement of accessories which includes a protective carry case, neck strap, lens covers, cleaning cloth and an instruction booklet. Whilst the amount and thickness of the internal padding is minimal, it has a semi-rigid design that I feel offers the instrument a reasonably adequate level of protection. The binoculars fit nicely within the case and it is possible to easily close the zip with the eyecups on the instrument extended, the lens covers attached and with the neckstrap inside as well which is great as you won't believe how many manufacturers forget this small but important detail. The bag has two closures, firstly there is a zip that goes right around three sides of the case. The on top of this there is a flip over lid that is held down with a strip of Velcro. These two fasteners make for an extremely secure case and possibly it is a little overkill. Having to open both of these to gain access to your instrument does take a little extra time and in certain situations, time can be critical or at best it gets a little annoying if you have to do it often. So what I like to do in the field is leave the zip completely open and just use the Velcro closure. Then once I am back home and storing my optics I close both. This offer better security and complete protection against dust. With the zip and Velcro closures, some users like birders or hunters who need to remain silent will also have to be careful when using them. It is in these situations that magnetic fasteners, whilst less secure may be preferable. The felt like material interior is nice and soft and on the inside of the bag, there is also a separate netted pocket that makes a great place to keep the cleaning cloth and perhaps some other small items for use when out in the field. The bag comes with its own un-padded carry strap and can be removed using the quick release clips. On the rear of the bag, there is a belt loop. Especially at this price range and Along with the carry cases, the neck straps are often one of the areas where brands look to save money on production costs and so they can often be some of can be something of a hit-and-miss affair. Gladly, in this case, Bresser whilst not completely hitting the ball out of the park, have most certainly given it a good hit and have supplied us with one of the better straps that you could ever hope to get at this mid-level price range. The padded section is made from what looks like a Neoprene type of rubber which is left uncovered on the underside to add grip and prevent it from sliding about around your neck and shoulders. The upper surface is covered with a fine material, the stitching looks excellent and is branded with the Bresser name and logo. This is a small detail, but many cheaper instruments come supplied with mass-produced, generic, unbranded straps. The padded section is reasonably wide and thick (37mm x 5mm) and thus offers a reasonably good level of padding and therefore comfort for this size and weight of instrument. Note: Unlike some this padded section is not curved which is something that I look out for as it just adds that fraction more comfort as ensures a better, more natural fit around your neck and shoulders. The padded neck section of the strap is then connected to the thinner straps using the standard method of sewing it together with the help of a faux leather strip. Here the stitching is also very good, the connections look secure and so should not easily come apart. Attaching these straps to the binocular is achieved in the normal way by threading them through the eyelets on the sides of the instrument and then back on them self and through a slider which enables you to adjust the length of the strap. This tried and tested method works well enough, but can be a little time consuming to set-up and then remove should you wish. However, the great news here is that Bresser has also included a couple of quick-release clips on the two thin strap sections. This means that once set-up you can easily and very quickly remove the padded neck section, then these two clips can then be joined to form a hand strap or can also be used to attach the binocular to a harness. This is another small but excellent attention to the small details that Bresser show on these binoculars and I feel is well worth highlighting. The rain-guard (ocular lens cover) is a very typical design. 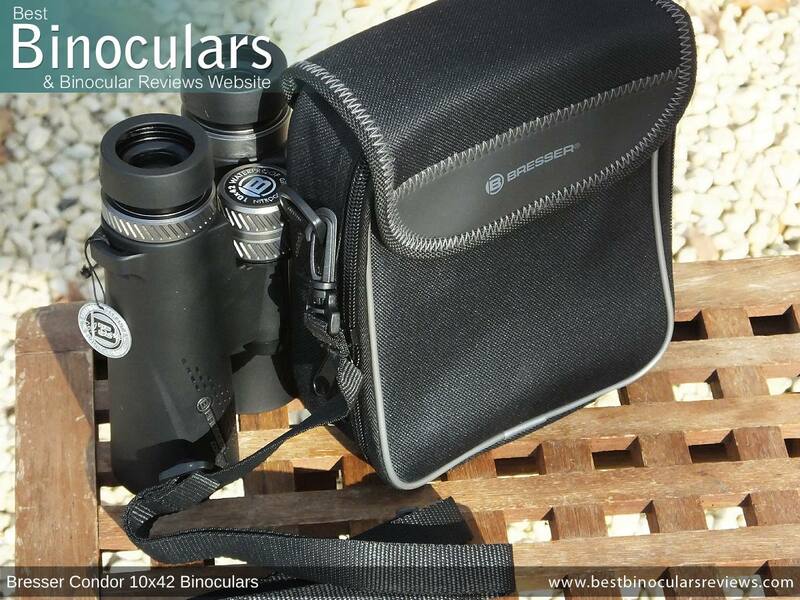 Made from a soft rubber/plastic it fits very well over the eyecups of the binocular, is easy to take on and off and provides a good level of protection. The bridge connecting the two cups is flexible meaning that it can be placed onto the eyecups regardless of your IPD setting. As per normal, the guard also has a loop on one side so that the neck strap can be threaded through it if you wish. Made from a slightly stiffer rubber/plastic than the rain-guard the objective lens covers look similar in that the two cups are also joined together with a bridge. This is a little different from the normal solution on a modern binocular where you have two separate cups that are tethered to each of the barrels on the instrument in some way. I have to say that that whilst the cover on this Bresser binocular works well in that it protects your lenses and fits very well into the ends of the barrels, my preferred choice would be the usual as option as it is much more convenient and you are less likely to misplace lens covers that are tethered to the barrels. Printed with the Bresser logo, the micro-fibre cleaning cloth is of a good, but not excellent quality. At this price, this is normal and thus fine for cleaning the body and perhaps very lightly dusting the lenses in an emergency when out in the field, but as always, I suggest you use a good lens cleaning kit for thoroughly cleaning the lenses. As far as these go the instructions supplied with these Bresser Condor binoculars is reasonably comprehensive in that it covers the main points on IPD adjustment, diopter settings, eyecup settings, attaching a tripod adapter and cleaning. 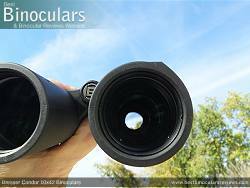 However the manual is not specific to this series and caters for all Bresser binoculars including porro prism designs. The warranty of this series is the same premium warranty as Bresser use with their flagship Pirsch ED which is really impressive as it means that you get a lifetime warranty if you register the product on their site. This includes damages caused not intentionally by the user. The following table lists the main details of these Bresser binoculars as well as a small selection of other mid-range 10x42 binoculars in the BBR database. To view the full results, open table in full-screen mode. There is no doubt that the Condor series from Bresser has come a very long way since I reviewed my first pair over a decade ago now. Indeed, I would go as far as to say that the differences now are so vast that I'm a little surprised that they have not put this under a completely new series. 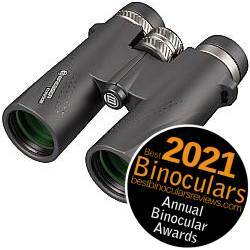 Anyway, the great news for us is that all these changes are for the good and these Bresser Condor 10x42 binoculars are far improved and in my opinion, they most certainly rank amongst the best within the mid-level price category. What is all the more impressive is that at their current retail price (approx:$200 / £150 / €160) they sit well below the $300 / £300 / €300 mid-level price threshold that I use on BBR and thus are not only competing with but in many cases beating instruments that are substantially more expensive than these. 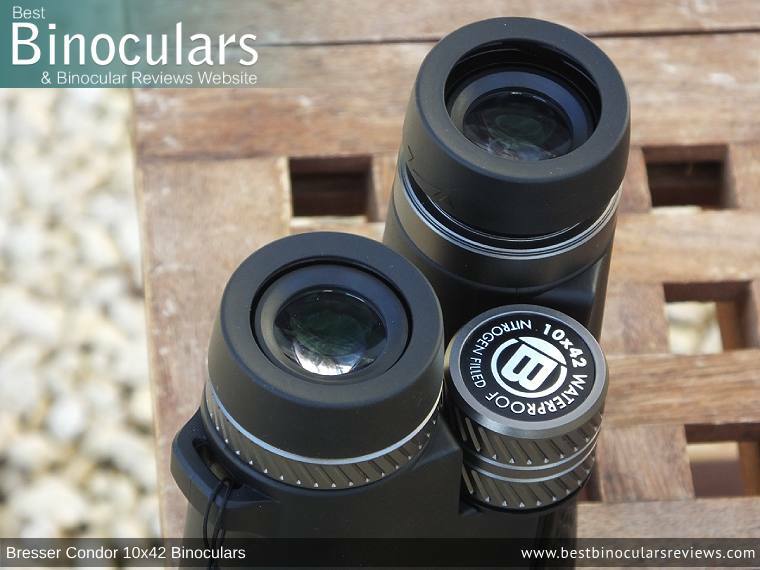 At this price, it is not often that you find a binocular with features like metal eyepiece housings, focus wheel and diopter adjuster. The exterior coating and design also looks great and certainly adds to the quality look and feel you get with these. In fact, I would say that they look and feel far more expensive than what they really are which is always nice. 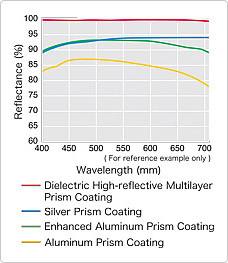 Whilst top-tier binoculars will have features like dielectric mirror coatings on the prisms, at this price range, the level of optical components and coatings used is good although whilst perfectly acceptable and normal not to have them at this price, I would have really liked to have seen phase correction coatings on the prisms. 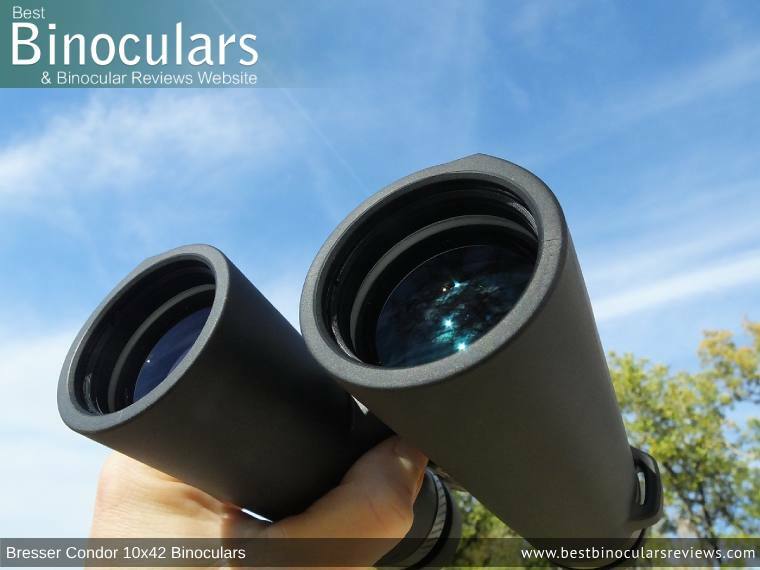 For 10x42 binocular, both the brightness and image quality are excellent and easily as good or better than the majority of the mid-level priced competition. I would even go as far as to say that they will certainly give many mid-high value 10x42 binoculars a run for their money. The included neck strap is very good and certainly better than most at this level. Whilst lightweight, it is well padded, has a non-slip underside and I like the quick release clips which enable you to easily remove the padded section and either convert it to a hand strap or attach it to a harness. 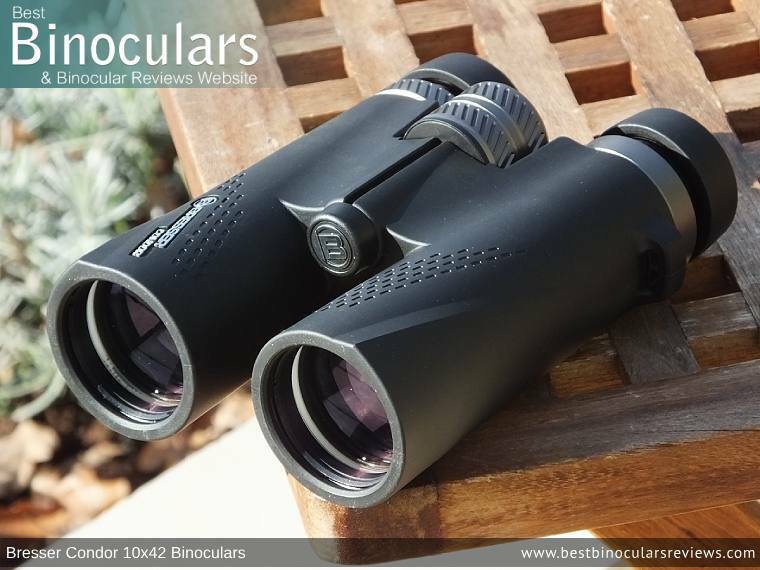 Taking into account the 10x magnification, these Bresser Condor 10x42 binoculars have more than decent field of view. Indeed at 111m @ 1,000 meters (333ft@1000yds), it is wider than some top-end 10x42 binoculars like the impressive Swarovski 10x42 SLC and Opticron 10x42 DBA VHD. Whilst I prefer it than one that is too loose, when I first used it, the diopter ring on my sample was a little too tight and difficult to adjust. However, I would also like to add that it did loosen up after turning it completely back and forth a few times and so may have just been that the lubricant had not yet worked into the right place from the factory. I am not a huge fan of the type of objective lens caps that have been used on these Bresser Condor binoculars. I will concede that they work well, fit very well into the ends of the barrels and you can thread them onto the neck strap should you wish. But for my money it is much more convenient and you are less likely to loose lens covers that are tethered to the barrels. In their stats, Bresser's 'official' stated minimum close focus distance of 3m (9.8ft) is fine for most users, but not quite short enough should you like to often view things like butterflies from very close range.